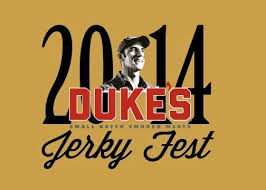 Duke’s Smoked Meats is compiling interest to produce the first annual “Jerky Fest” this upcoming summer of 2014. Ideally, the daylong festival and competition would showcase craft smoked meats from across the nation and provide an engaging experience complete with beer, music and of course, jerky. The event would be free for participating vendors and would provide a valuable opportunity to sample jerky and sell product to the general public. “Jerky Fest” would also include a competition where a team of judges would review each vendor’s submitted product and name winners from a variety of different meat categories. Currently, we are gauging how much interest this event potentially has and encourage you to sign up, if at all interested. Keep in mind, signing up IS NOT a confirmation of participation but, once we get more details together, if interested we will reach out to you with more information. Again, this event is free for vendors and is a call of interest. More information on location, date and submission process to come.